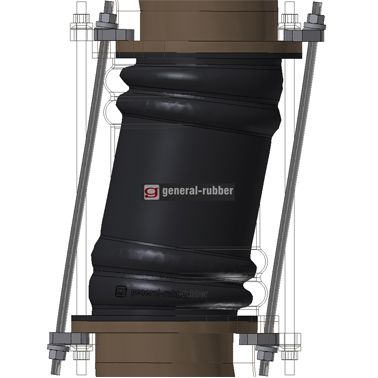 General Rubber's Style 5100U universal rubber expansion joints feature two resilient arch sections separated by a straight section to facilitate greater lateral movement capability. This single unit arrangement represents an effective solution for absorbing axial thermal movements from adjacent pipe runs. Additionally, they are designed to absorb large all-directional movements, reduce noise and vibration, have a cycle life in the tens of millions, compensate for misalignments, provide access to piping and equipment and relieve pipe and anchor stresses. Its spool type body is constructed with full rubber flanges, a high-grade leak-proof tube, multiple layers of high-strength tire cord, high tensile steel reinforcement, a seamless cover and hot dip galvanized steel retaining rings. Their control units are externally or internally attached and used as limit rods for secondary restraint in a properly anchored piping system or as tie rods when the support structure or adjacent equipment have load limitations.